It weighs 850 tons and took nearly half a year to put together. The steel inner ring of the roof at Vodafone Arena has been going up inch by inch since Thursday. Lifted upwards by a set of cables, the structure is moving vertically at the speed of some 3m / 10 feet daily. Known from other cable-roof stadiums, this operation is extremely sensitive and requires constant monitoring to assure it’s going correctly. This means its end can only be estimated at this point to be late next week. Once put into place above the stands, the inner ring will be connected with 84 outer columns to gain stability. Altogether the structure will weigh some 2,500 tons. Beşiktaş’s new stadium is under construction since 2013 and was initially announced to be ready by the end of last year. Clearly this wasn’t the case and now opening is expected in 2016. 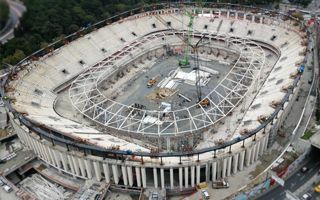 Named Vodafone Arena for commercial reasons, the building will hold almost 42,000 people. Local constraints prevented it from growing further.